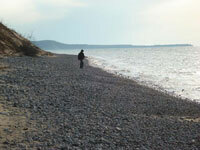 This month’s Grand Marais Scenes feature photos that were taken while I’ve been on my daily exercise hikes. 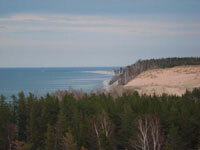 The first photo was taken from up in Grand Sable Dunes. It shows an interesting angle of the dunes with the breakwater in Grand Marais in the distance. The second picture shows my friend, Scott Wieting, as we were walking back after the long dune trek, after which we climbed down the Grand Sable Banks and returned via the beach. Notice all of the rock on the beach. The next two photos were taken on Memorial Day. 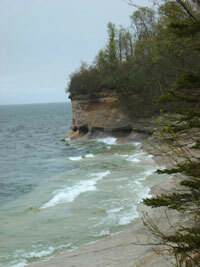 My friend, Kim Amthor, and I left Grand Marais around 10:30 am and drove through Melstrand to the Chapel Parking Area. Our plan was to hike the “Chapel Loop,” which we successfully accomplished. In Grand Marais, it was 64 degrees when we left. 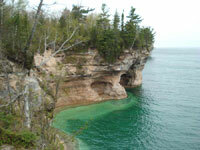 The first picture was taken not long after we hiked past Chapel Rock heading west toward Mosquito Beach. During the next hour or so after taking this picture, the temperature dropped around 26 degrees and the wind increased to more than 30mph. I must admit that I didn’t bring any gloves and had to share the pair Kim brought so that my fingers were warm enough to properly operate my camera. The second picture was taken at Mosquito Beach after the cold front moved through. The moral of the story is that whenever you are hiking on the Lake Superior shoreline, you must be prepared for almost anything. Yet again, I learned this lesson the hard way!